Boys' Checked Button Up Shirt Only $14.98! 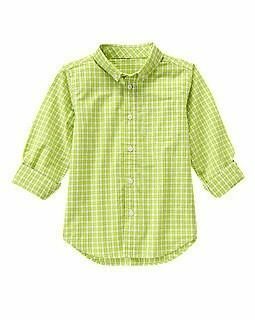 You are here: Home / Great Deals / Boys’ Checked Button Up Shirt Only $14.98! Boys’ Checked Button Up Shirt Only $14.98! This 100% cotton poplin shirt is a great Spring top for your little man! The Boys’ Checked Button Up Shirt for Only $14.98 has a shirttail hem and back pleat. There are also matching family styles available!